ssilk wrote: Another good reason for belt/lane balancers is to avoid that ore-fields are mined "unsymmetrical". Left miners are earlier exhausted than right. For example. That only applies if you use a fractal mining design, such as this one. For normal mining setups you just shift the left/right problem to a front/back problem. Front/back? I don't get it, can you elaborate? I believe he means that instead of the ore tiles on one side of the conveyor getting emptied first, you'll change the problem to all the ore tiles furthest away from the mine's output getting emptied first. Mathematically, I suspect both result in the same output-over-lifespan. Also doubles as a count perfect 2 to 1. Why does people keep quoting the broken 3 underground version instead of this one? The underground one is broken as some items get stuck in it, that may be fine in many cases but it still leaves situation where it's bad. Miravlix wrote: Why does people keep quoting the broken 3 underground version instead of this one? The right one costs 60 less iron and 6 less lubricant. For the reason why people advocate the underground belt version, I would guess because it is smaller. hansinator wrote: Front/back? I don't get it, can you elaborate? Mehve got it basically right with his interpretation. At a guess, the need for lane balancing tends to imply that you're moving/processing fairly large quantities over long periods of time, to the point where a measly dozen or so items becomes insignificant in comparison. d4rkpl4y3r wrote: For the reason why people advocate the underground belt version, I would guess because it is smaller. You completely ignored my point about the one with stuck items being broken in some situations, so I'm not sure how to have a discussion about the topic, if it's irrelevant what I say. It's 100% safe to recommend the non underground belt version, because it works in every single possible situations. Sure recommend the underground one for space or whatever reason, but don't do it without pointing out it's flaw. 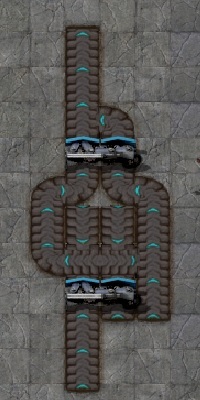 You say it is broken, but I have yet to see where the 1 belt lane balancer with underground belts has any flaws besides stuck items or the higher cost in materials. Could you please elaborate what you mean by that? Mehve wrote: I believe he means that instead of the ore tiles on one side of the conveyor getting emptied first, you'll change the problem to all the ore tiles furthest away from the mine's output getting emptied first. Mathematically, I suspect both result in the same output-over-lifespan. I still don't get it ^^ Pictures? Miravlix wrote: The underground one is broken as some items get stuck in it, that may be fine in many cases but it still leaves situation where it's bad. It is not broken in the sense that it balances the lanes perfectly. What exactly do you mean with stuck items? In both cases 6 mines stopped working. So adding a lane balancer there would not change the fundamental problem of unequal miner usage, it just changes the layout. d4rkpl4y3r wrote: In both cases 6 mines stopped working. So adding a lane balancer there would not change the fundamental problem of unequal miner usage, it just changes the layout. With the latter case there's 9 tiles of belt which can now be removed. 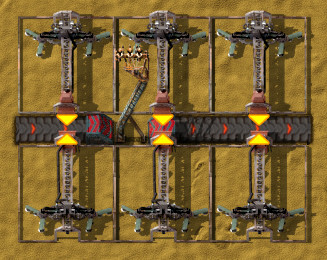 If you have very fast miners (Bob's mod comes to mind) you might be able to fully compress a belt with, say 6 miners. But since you wanted to cover the entire resource patch with miners your column of miners is now 10 miners long, on both sides of the belt (2*10=20). 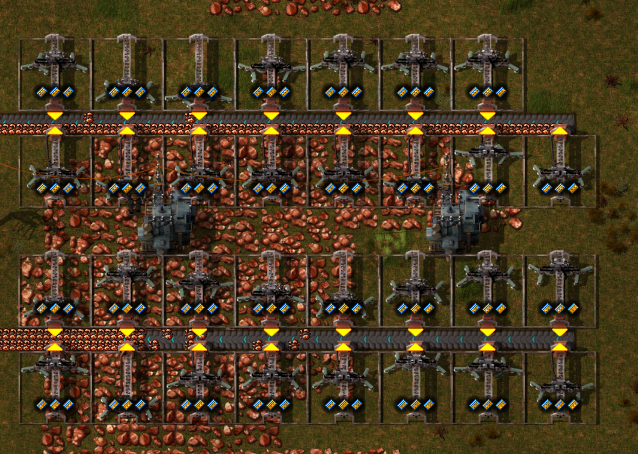 So when one side of your belt is emptied faster the miners on that side of the belt will run out of ore earlier. Say that after some time you have only one miner left on that faster depleted side but still have 7 left on the other side. So the side with 7 miners is fully compressed and 4 of the miners arent working but the one miner on the other side cannot compress taht side of the belt. 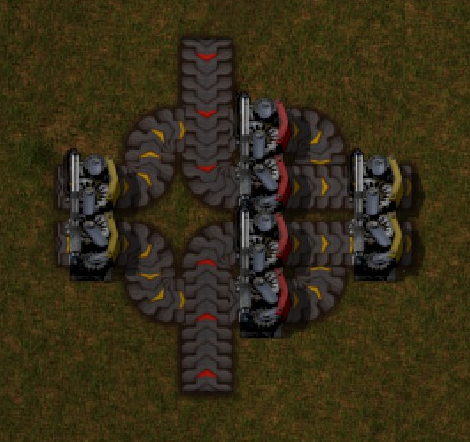 To fully compress the belt now, you need to reroute at least 2 miners from the side with the more miners to dispose the ore on the side with only 1 miner. If you had placed a lane balancer on the output belt of the ore patch your miners would have been depleted evenly and your belt would have still been compressed after (9+3=) 12 of your miners ran out because there would be still (20-12=) 8 miners left which is 2 more than you need to compress the belt. Thank you, now I get it I was thinking too complex.. Your statement doesn't contradict Yoyobuae's. 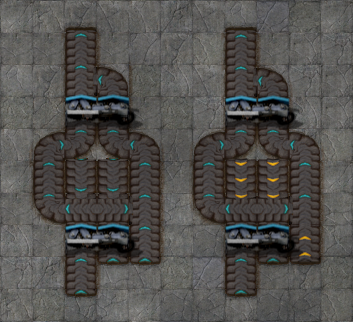 It's not the lane balancer vs the 9 pieces of belt. In the first case you need a lane balancer AND all belt tiles. In the latter case you don't need a lane balancer and you can successively remove belt tiles as the miners stop working. welcome to the forums. use this code for posting blueprint strings. Not sure how many of the criteria of balancing it fulfills. We should develop a Standard Testing Regime against which all kinds of contraptions are tested. MBas, that doesn't function for the purpose of this thread. which is to rebalance the left and right sides of the belts.